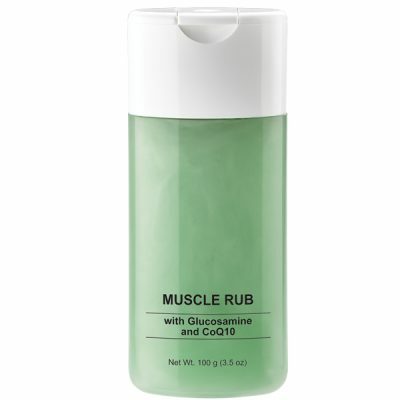 This soothing muscle rub contains a powerful blend of ingredients targeted to help soothe sore muscles and alleviate joint pain. Glucosomine, Emu Oil and CoEnzyme Q10 work together as a natural remedy to relieve the pain and stiffness associated with tendonitis, muscle soreness, and athletic injuries. Water (Aqua), Dimethyl Sulfone, Emu Oil, Alcohol Denat., Flavor (Aroma), Fragrance (Parfum), Carbomer, Sorbitol, Triethanolamine, Phenoxyethanol, Menthol, Aloe Barbadensis Leaf Juice, Squalane, Ubiquinone, Tocopheryl Acetate, Sodium Chondroitin Sulfate, Glucosamine HCL, Salix Alba (Willow) Bark Extract, Capsicum Frutescens Fruit Extract, Zea Mays (Corn) Oil, Ethylhexylglycerin, Alcohol, Glycerin, Potassium Sorbate, Sodium Benzoate, Citric Acid, t-Butyl Alcohol, Coumarin, Blue 1 (CI 42090).